Alsatian rabbi; born at Ribeauville, Alsace, Sept. 15, 1735; died at Sulz May, 1781. At the age of ten he was advanced in his training for the rabbinate sufficiently to follow the elaborate lectures of Jonathan Eybeschütz. Later, Carmoly studied successively at Frankfort, under the direction of Jacob Joshua, author of "Pene Yehoshu'a," and at Metz, under Samuel Helman, who conferred upon him the title of rabbi. On returning home, in compliance with the wish of his father, Carmoly began the study of medicine under the direction of Jacob Assur, a physician of Nancy, but had to give it up, being engrossed with his Talmudical studies. The only benefit he derived from his tutor was a fair knowledge of mathematics, of which he made use later. Carmoly married the daughter of a rich banker named Joseph Raineau. The latter persuaded the bishop of Sulz to create a rabbinate in his see; and Carmoly was appointed rabbi of Sulz. Carmoly was the author of a commentary on the Tosefta to the treatise Beẓah, published, together with the text, under the title "Yam Yissakar" (Sea of Issachar; Metz, 1769). 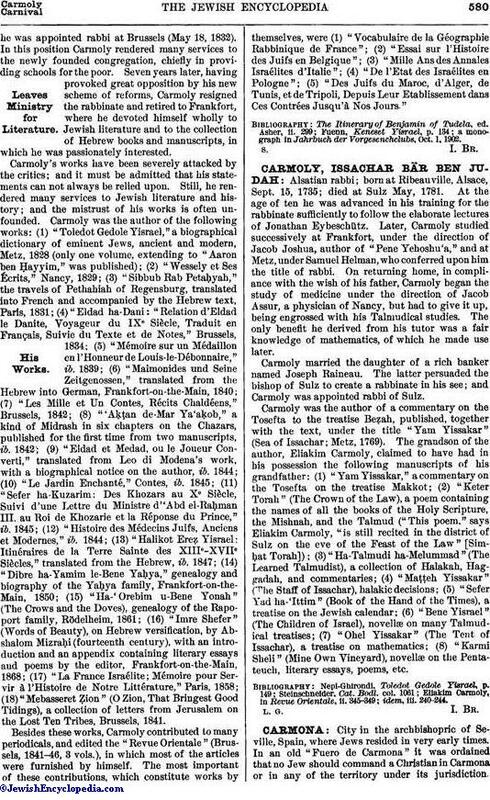 The grandson of the author, Eliakim Carmoly, claimed to have had in his possession the following manuscripts of his grandfather: (1) "Yam Yissakar," a commentary on the Tosefta on the treatise Makkot; (2) "Keter Torah" (The Crown of the Law), a poem containing the names of all the books of the Holy Scripture, the Mishnah, and the Talmud ("This poem," says Eliakim Carmoly, "is still recited in the district of Sulz on the eve of the Feast of the Law" [Simḥat Torah]); (3) "Ha-Talmudi ha-Melummad" (The Learned Talmudist), a collection of Halakah, Haggadah, and commentaries; (4) "Maṭṭeh Yissakar" (The Staff of Issachar), halakic decisions; (5) "Sefer Yad ha-'Ittim" (Book of the Hand of the Times), a treatise on the Jewish calendar; (6) "Bene Yisrael" (The Children of Israel), novellæ on many Talmudical treatises; (7) "Ohel Yissakar" (The Tent of Issachar), a treatise on mathematics; (8) "Karmi Sheli" (Mine Own Vineyard), novellæ on the Pentateuch, literary essays, poems, etc.